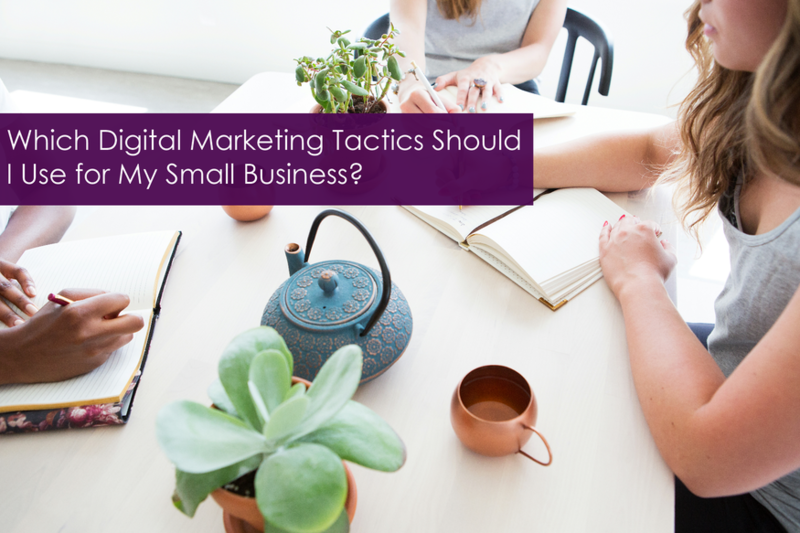 Which Digital Marketing Tactics Should I Use for My Small Business? You will know which marketing tactics to use by understanding your ideal customers and giving them what they want, when they want it. Today's digital marketplace is noisy and overwhelming. It's easy to find virtually any answer to any question you have just by using Google Search. So how does a small business get his or her business found in that black marketing hole we call the internet? You do it by really understanding who your customers are, what they want, what their pain points are and where they "live" on the internet, and then laser targeting your marketing tactics and assets to them. In general, there are 3 stages in the journey each customer takes before they are ready to make a purchase from you. At each stage of the "buyers' journey" a marketer needs to provide them with the information they need at that moment to help them move forward in their journey. Social media. Social media is the billboard of the internet. Millions of people "live" in social media. This is a great place to make that initial connection with your ideal customer. Google search. For this, we use search engine optimization, publishing on social media channels and blogging. Lead magnets. This is where we use lead magnets (i.e. short ebooks, short videos, webinars, email marketing, autoresponders with drip campaigns, etc.) to invite potential customers to get to know you better. Paid advertising. The internet is fast becoming a pay-to-play marketplace. Consider using Facebook ads, Google Adwords and other online advertising opportunities, depending on where your audience "lives", to increase exposure for your business. Once a potential customer is aware you exist, they will want to learn more about you. This is also the time where you are building credibility with your potential buyer and showing that your services / products will meet their needs and satisfy their pain point. Website content. People will want to read your website to learn more about your business. The copy, images, videos and other content on your website has to satisfy their curiosity. Blogging. People love blogs. Google loves blogs and will rank your site higher when you blog regularly. Blogging (and vlogging) is one of the best ways to help your potential customer get to know you better. Epublications. This is the time when people want more information about what your product / services and your industry as a whole. This is where FAQs come in, research-based reports or other educational publications. Videos. The market LOVES videos and will consume video content like crazy. There are lots of ways to create videos using today's technology. What are you waiting for? Get busy and get some video content out there! Your potential customers will love you for it! Emails. People love emails when they are about something they are interested in. One common myth is that people will reject your business if you email too often. The truth is that it depends on your subject line. If they've opted in to your email list and you're sending out relevant emails that interest them, they will open them! Emails are great because they build a relationship with your audience. When an email comes into your inbox, it is more personal than say, reading a blog post or a posting on social media. They have opted in to be on your list; this is your opportunity to develop an affinity with them. Social media. Social media is a good way to remind people you are there and to keep them interested in your business. Free courses. People prefer to have information "dripped" to them in small amounts at a time. Creating a free course that is dripped out in their email inbox is a great way for them to get to know you better. Now your potential customers are ready to buy. They realize they have a problem and want a solution. The question becomes, will they choose to buy your solution or find a different solution? This stage is all about helping them make that final decision to buy. Email marketing. People have learned to trust you through the relationship you have built with them in their emails. This is one of the best places to deal with their objections and answer those questions they have in their minds. Call-to-action. Ideally, you will use call-to-actions (CTA) at every stage of the buyers' journey. Now it's time to use stronger CTAs to get them to take action. Incentives. Your ideal customer knows, likes and trusts your business. Now it's time to offer an incentive to spur their action to make that purchase. Incentives are promotions like coupons, discounts or bonuses. Evaluation. This is also a good time to get to know your customers better. Asking questions and analyzing the effectiveness of your campaigns at this stage can help you refine your strategy and improve your marketing efforts. What digital marketing tactics have worked the best for your company? Why do you think they have been effective?